The holiday season is almost upon us, and that means it’s time to get your warehouse and equipment ready for two months of heavier-than-normal demands. 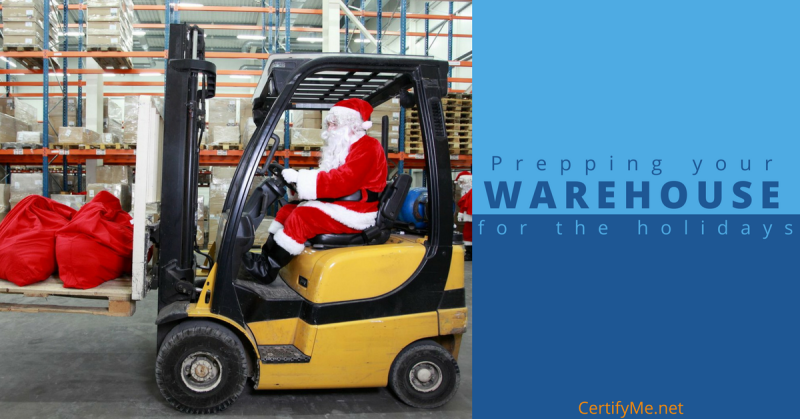 The holidays keep everyone busy and require some extra preparations to ensure that your warehouse is a safe working environment and your essential equipment is ready to work hard. Here are some tips to get your warehouse ready for the holidays. There are few things that can make your holiday season more stressful and hectic than your warehouse being poorly organized for the holiday rush. You may want to carefully consider where you are storing popular holiday items, to ensure that your staff is not running all over your warehouse to fill orders. Keep holiday products close to packaging areas, so that orders can be filled quickly, and safely. Don’t let a shortage of aerial lifts and forklifts slow your warehouse efficiency during the holidays. Make sure that you have plenty of the equipment you need. Many local equipment companies are prepared to rent warehouses the necessary equipment, at reasonable rates, during the holidays. The other thing that can really cause chaos in your warehouse, during the holiday rush, is equipment that is broken. Make sure that all of your forklifts, hand lifts and other essential warehouse equipment is serviced and in great condition before you head into the holiday season. And, make sure that all of your operators know how to properly check their equipment for issues. If you have a good warehouse management software program, the holiday season is the perfect time to make the most of its capabilities. Use historical trends to stock the most popular items well in advance. Then use your software system to ensure that all orders are filled and shipped in a timely manner. Most importantly, don’t change software systems right before the holidays. This is a sure way to create huge holiday problems. A shortage of good, trained employees is a sure fire way to have a holiday season disaster. Fill temporary positions well before the holiday rush sets in. This enables you to get quality employees and get them trained on equipment, software, processes and safety procedures well before your warehouse is in a rush. Finally, but maybe most importantly, make sure that all of your employees are properly trained in safety procedures. This includes all of your long-term regular employees and temporary employees. Make sure they know proper equipment operation and understand the flow and traffic patterns of the warehouse. And, don’t forget to provide the proper personal protective equipment (PPE) to all employees. PPE can make the difference between a safe and productive warehouse and lost time due to injuries. For many businesses, the holiday season is the make or break time of year. Follow these easy tips for a safe and productive holiday season in your warehouse. Contact CertifyMe.net for all of your operator training needs. It’s quick and easy!